MOKOPANE, SOUTH AFRICA – Ivanhoe Mines' (TSX: IVN; OTCQX: IVPAF) Executive Co-Chairman Robert Friedland, Chief Executive Officer Lars-Eric Johansson and Ivanplats' Managing Director Dr. Patricia Makhesha announced today that Platreef's Shaft 1 has reached the top of the high-grade Flatreef Deposit (T1 mineralized zone) at a depth of 780.2 metres below surface. The achievement by the Ivanplats shaft-sinking team is the first time that the Platreef – a strongly mineralized, polymetallic belt that extends northward from the town of Mokopane for more than 30 kilometres – has been intercepted by underground mining activity. Ivanplats' Flatreef Deposit, with a strike length of six kilometres, lies within a flat to gently dipping portion of the Platreef mineralized belt at relatively shallow depths of approximately 700 to 1,200 metres below surface. The Platreef mining team has delivered the first ore from the underground mine development to a surface stockpile for metallurgical sampling. The estimated thickness of the mineralized reef (T1 & T2 mineralized zones) at Shaft 1 is 26 metres, with grades of platinum-group metals ranging up to 11 grams per tonne (g/t) 3PE (platinum, palladium and rhodium) plus gold, as well as significant quantities of nickel and copper (see Chart 1, page 5). The 26-metre intersection will yield approximately 3,000 tonnes of ore, estimated to contain more than 400 ounces of platinum-group metals (PGMs). "This is a significant milestone for Ivanplats and a tribute to the excellent work by the Platreef Project team and its South African sinking contractor, Aveng Mining," said Dr. Makhesha. "We now can proudly show our stakeholders and investors Flatreef's remarkably high-grade and thick, flat-lying orebody that is ideal for safe, underground, bulk-scale, mechanized mining. "Our focus is to keep advancing the Platreef Project along its critical path. We remain true to our commitment to build Platreef into the world's next great platinum-group metals mine ─ a showcase for South Africa and the international investors that have financed the exploration and development work," Dr. Makhesha added. Mr. Friedland noted that while some investors have expressed concern about the current price of platinum, Platreef also has massive quantities of palladium, nickel and copper, as well as rhodium and gold. He said the steady surge in the price of palladium could see it become more valuable than gold for the first time in 16 years, and rhodium prices are near eight-year highs. The platinum-to-palladium ratio at the Platreef Mine is approximately 1:1. Palladium and rhodium are used as catalysts to control exhaust emissions in gasoline-fuelled vehicles, while diesel vehicles mostly use platinum. Platinum also is used as the catalyst in zero-emission, hydrogen-powered, fuel-cell electric vehicles now being developed by many of the leading, global automakers, such as Honda, Toyota, BMW, Mercedes-Benz and Hyundai. "Building a new, large-scale mine such as Platreef is a capital- and time-intensive process that requires us to embrace the future, and the future we see will include a lot more electric vehicles using batteries and fuel cells," Mr. Friedland said. "We are confident that platinum, copper and nickel will be among the biggest beneficiaries of the accelerating global transition to electric vehicles and clean energy. "The Northern Limb is the future of platinum-group-metals mining. We will have the distinct advantage of having a highly-mechanized, underground mining operation with a small environmental footprint. 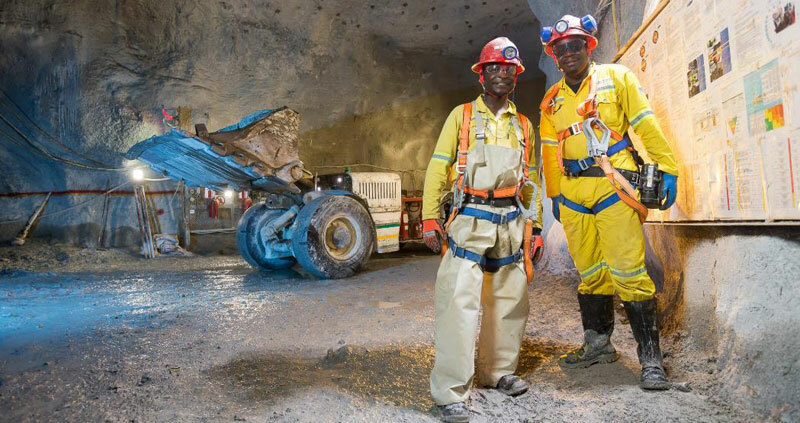 "On behalf of our stakeholders, international shareholders and progressive end users of our metals, we are pleased to be leading the positive transformation in the way future underground platinum mining operations in South Africa will be conducted," Mr. Friedland added. In July 2017, Ivanhoe issued an independent, definitive feasibility study (DFS) for Platreef covering the first phase of production at an initial mining rate of four million tonnes per annum (Mtpa). The DFS estimated that Platreef's initial, average annual production rate will be 476,000 ounces of platinum, palladium, rhodium and gold, plus 21 million pounds of nickel and 13 million pounds of copper. Aveng Mining, in Shaft 1 at the intersection of the Flatreef Deposit. pentlandite (nickel sulphide) and chalcopyrite (copper sulphide) mineralization. 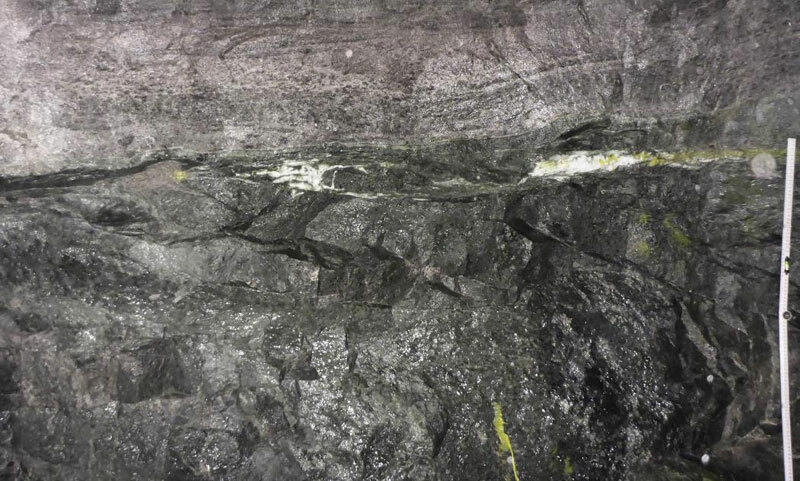 part of the Flatreef mineralized T1 pyroxenite (at bottom) in the Shaft 1 intersection. Geotechnical drill hole GT008, drilled vertically below Shaft 1, indicates that the grade for the T1 mineralized zone at the Shaft 1 location is 4.83 g/t 3PE plus gold, 0.33% nickel and 0.15% copper over a vertical thickness of 12 metres (see Chart 1, page 5). 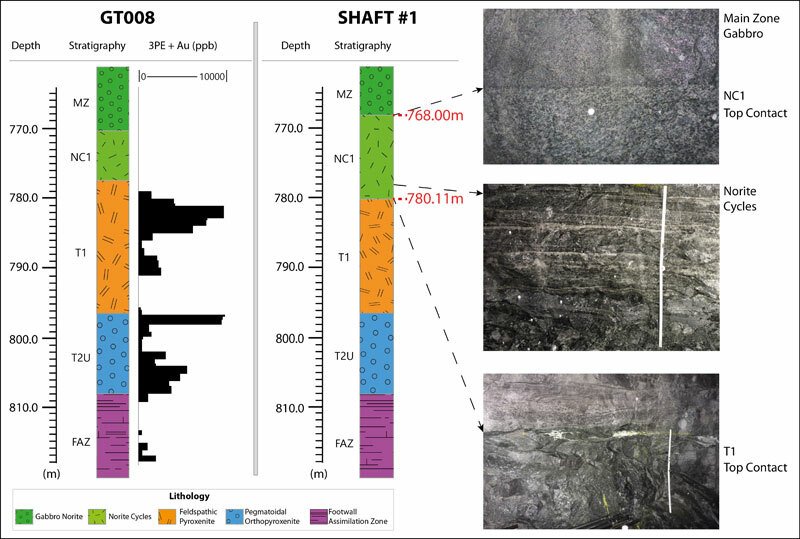 A well-developed chromitite stringer, marking the stratigraphic contact between the T1 and T2 mineralized zones, is expected to be intersected at a shaft depth of approximately 795 metres. This will be followed by the T2 mineralized zone, which grades 4.14 g/t 3PE+gold, 0.35% nickel and 0.18% copper over a vertical thickness of 11.26 metres (at a 2 g/t 3PE+gold grade cut-off). intersection of the top of the Flatreef Deposit (right). The 750-metre station on Shaft 1 will provide initial, underground access to the high-grade orebody, enabling mine development to proceed during the construction of Shaft 2, which will become the mine's main production shaft. The mining zones in the current Platreef Mine plan occur at depths ranging from approximately 700 metres to 1,200 metres below surface. As shaft-sinking advances, two additional shaft stations will be developed at mine-working depths of 850 metres and 950 metres. Shaft 1 is expected to reach its projected, final depth of 980 metres below surface, complete with the stations, in early 2020. The thick, flat-lying orebody at the Platreef Project is ideal for bulk-scale, mechanized mining. As underground development progresses, the mine plan calls for the addition of large, mechanized mining equipment, such as 14- and 17-tonne load-haul-dump machines and 50-tonne haul trucks to support the planned long-hole mining method. 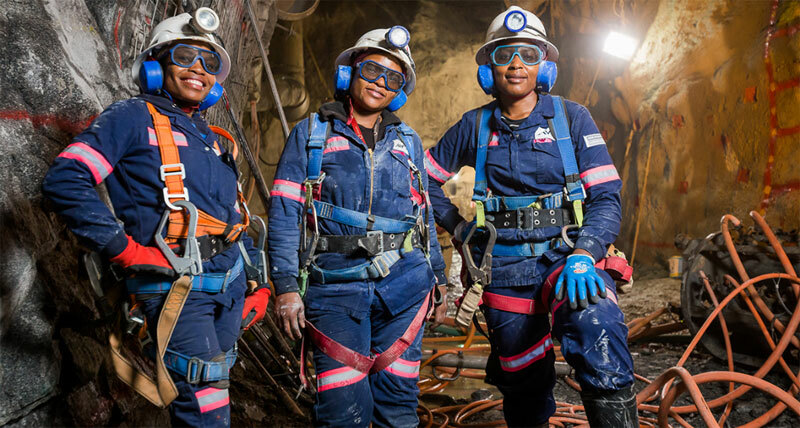 Approximately 40% of Platreef's shaft-sinking team now is comprised of employees from local Mokopane communities who had no previous mining experience. New employees receive intensive, on-site training for underground mining and complete a workplace-safety induction program. Excavation of the Shaft 2 box cut to a depth of approximately 29 metres below surface is progressing well. Completion of the box cut will allow for the construction of the concrete hitch (foundation) for the 103-metre-tall concrete headgear (headframe) that will house the shaft's permanent hoisting facilities and support the shaft collar. Shaft 2, to be located approximately 100 metres northeast of Shaft 1, will have an internal diameter of 10 metres, will be lined with concrete and sunk to a planned, final depth of 1,104 metres below surface. 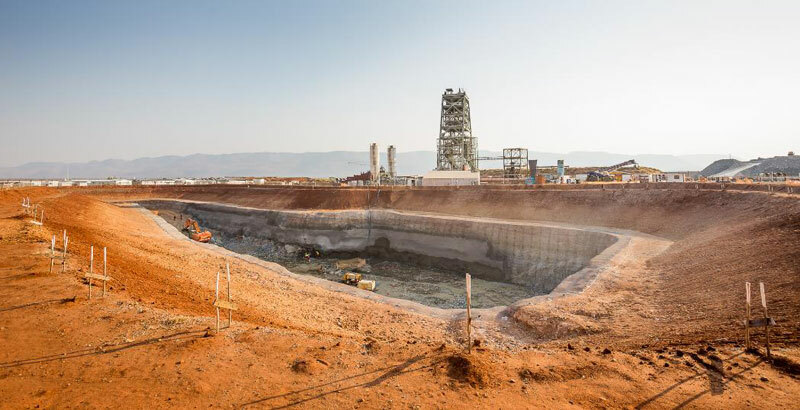 It will be equipped with two 40-tonne rock-hoisting skips with a capacity to hoist a total of six million tonnes of ore per year – the single largest hoisting capacity at any mine in Africa. Headgear for the permanent hoisting facility was designed by South Africa-based Murray & Roberts Cementation. Platreef's development team has decided to unbundle the complete Shaft 2 sinking contract into smaller commitment portions, while still maintaining the critical development path. Photo: Platreef's Shaft 2 box cut, with Shaft 1 headframe in the background. The Platreef Project, which contains the Flatreef Deposit, is a tier-one discovery by Ivanhoe Mines' geologists. 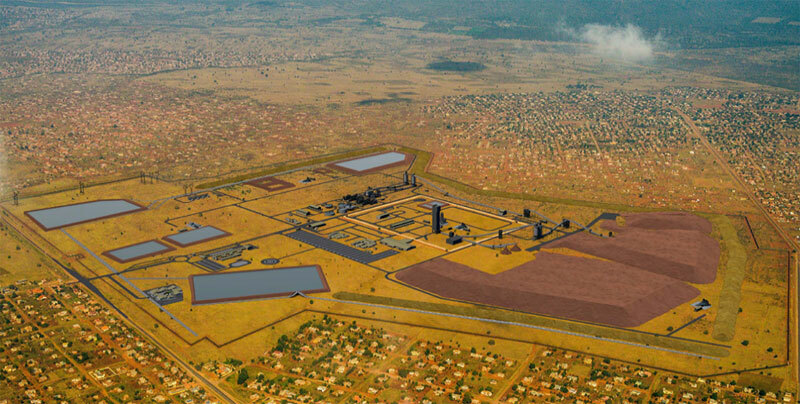 Based on the findings of the July 2017 independent DFS, Ivanhoe plans to develop the Platreef Mine as a major underground mining operation in three phases to achieve: 1) An initial rate of four million tonnes per annum (Mtpa) to establish an operating platform to support future expansions; 2) a doubling of production to eight Mtpa; and 3) expansion to a steady-state 12 Mtpa. As Phase 1 is being developed and commissioned, there would be opportunities to refine the timing and scope of subsequent phases of expanded production. Given the size and potential of the Platreef Mineral Resource, Shaft 2 has been engineered with a crushing and hoisting capacity of six Mtpa. This allows for a relatively quick and capital-efficient first expansion of the Platreef Project to six Mtpa by increasing underground development and commissioning of a third, two-Mtpa processing module and associated surface infrastructure as required. A further expansion to more than eight Mtpa would entail converting Shaft 1 from a ventilation shaft into a hoisting/ventilation shaft. This would require additional ventilation exhaust raises, as well as a further increase of underground development, commissioning of a fourth, two-Mtpa processing module and associated surface infrastructure, as described in the PEA as Phase 2 of the project. Sinker; and Caroline Dzivhani, Geologist. broad-based, black economic empowerment structure have a 26% stake in the Platreef Project. and Metals National Corporation and Japan Gas Corporation. Ivanhoe Mines is a Canadian mining company focused on advancing its three principal projects in Southern Africa: the development of new mines at the Kamoa-Kakula copper discovery in the Democratic Republic of Congo (DRC) and the Platreef platinum-palladium-nickel-copper-gold discovery in South Africa; and the extensive redevelopment and upgrading of the historic Kipushizinc-copper-germanium-silver mine, also in the DRC. Certain statements in this news release constitute "forward-looking statements" or "forward-looking information" within the meaning of applicable securities laws. Such statements involve known and unknown risks, uncertainties and other factors, which may cause actual results, performance or achievements of the company, the Platreef Project, or industry results, to be materially different from any future results, performance or achievements expressed or implied by such forward-looking statements or information. Such statements can be identified by the use of words such as "may", "would", "could", "will", "intend", "expect", "believe", "plan", "anticipate", "estimate", "scheduled", "forecast", "predict" and other similar terminology, or state that certain actions, events or results "may", "could", "would", "might" or "will" be taken, occur or be achieved. These statements reflect the company's current expectations regarding future events, performance and results, and speak only as of the date of this news release. The forward-looking statements and forward-looking information in this news release include without limitation, (i) statements regarding the 26-metre intersection of the Flatreef Deposit at Shaft 1 will yield approximately 3,000 tonnes of ore, estimated to contain more than 400 ounces of platinum-group metals (PGMs); (ii) statements regarding Ivanhoe's commitment to build Platreef into the world's next great platinum-group metals mine; (iii) statements regarding the expectation that Shaft 1 will reach its projected, final depth of 980 metres below surface, complete with the stations, in 2020; and (iv) statements regarding Ivanhoe's plans to develop the Platreef Mine as a major underground mining operation in three phases to achieve: 1) An initial rate of four million tonnes per annum (Mtpa) to establish an operating platform to support future expansions; 2) a doubling of production to eight Mtpa; and 3) expansion to a steady-state 12 Mtpa. In addition, all of the results of the Platreef DFS constitute forward-looking statements and forward-looking information. The forward-looking statements include metal price assumptions, cash flow forecasts, projected capital and operating costs, metal recoveries, mine life and production rates, and the financial results of the Platreef DFS. These include statements regarding the Platreef Project IRR of 14.2% after tax, the Platreef Project's NPV of US$916 million at an 8% discount rate after tax (as well as all other before and after taxation NPV calculations), estimated all-in cash costs (including the life-of-mine average estimate of US$351 per ounce of 3PE+Au net by-product credits and including sustaining capital costs), capital cost estimates (including pre-production capital of US$1,544 million), proposed mining plans and methods, a mine life estimate of 32 years, a project payback period of 5.3 years, the expected number of people to be employed at the Project, and the availability and development of water and electricity for the Platreef Project.